Love is most definitely in the Air! 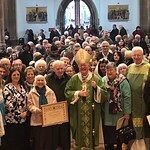 Over 6,500 years of marriage has been celebrated at St Chad’s Cathedral today (Sunday) – a truly remarkable achievement. The Cathedral was packed as almost 200 couples, and their families, gathered to take part in the diocese’s first Thanksgiving Mass for Marriage. It really was a sight to behold as hundreds of people streamed into St Chad’s to take part in a unique celebration. From engaged couples who are about-to-be-married right through to those celebrating more than 60 and 70 years as Mr and Mrs, it was wonderful to be amongst such love and commitment. 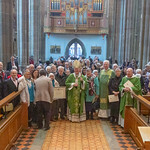 Archbishop Bernard Longley led the Mass and as part of the occasion all married couples had the opportunity to take the Renewal of Commitment. The majority of couples at the Mass were celebrating ‘milestone marriages’, and the most popular amongst those was Golden Wedding, marked by 36 couples. Archbishop Longley also had the honour of presenting a Papal Blessing to Maurice and Barbara Kelleher for their 70th wedding anniversary, which they celebrated on 28 February 2018. The couple travelled from Our Lady of the Assumption, Maryvale, to attend today’s Mass with family. In the run up to today’s event several couples had kindly shared an insight into their married lives - which can be read here or in this week’s Catholic Universe newspaper. The event was also supported by superb performances from St Chad's Cathedral Choir and representatives from the Alliance of Catholic Marriage Organisations.